These are other games from Shoreless. For more on my writing, please see my blog. Quill is a wonderful, single-player, 'letter writing' RPG by Trollish Delver. I was so taken with the game that I created my own little supplement to it, approved by Scott Malthouse. 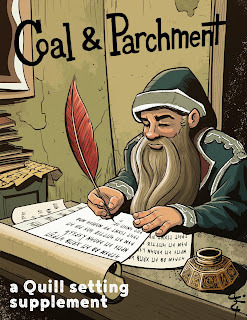 Coal & Parchment is set in the Homes and gives players a new way to both enjoy the core rules of Quill and interact with the world of The Dig. 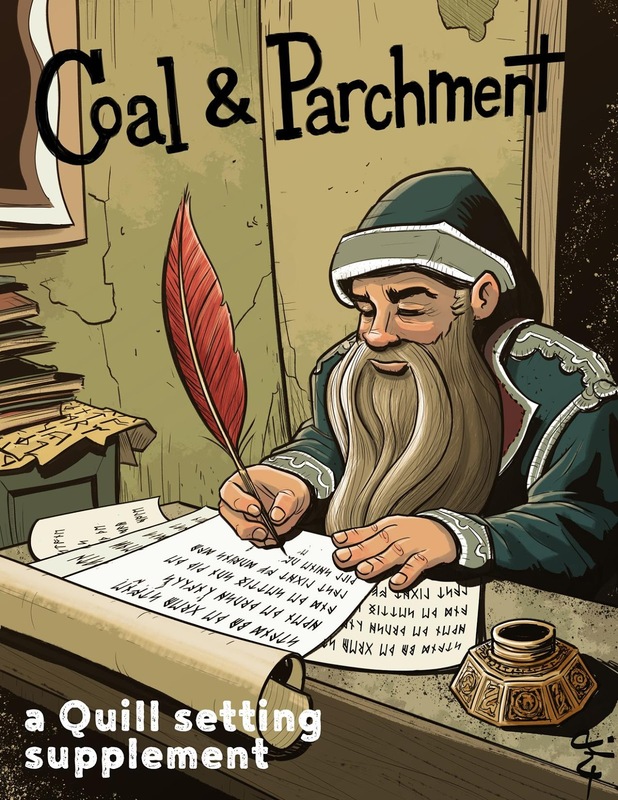 Coal & Parchment provides six new characters, three new skills, and five new scenarios to try, not to mention brilliant cover art by Jacob Hunt! Pay what you want for it today! Ehdrigohr: The Roleplaying Game by Allen Turner is one of my favorite roleplaying settings, if not one of my top fiction settings. Dungeon World is one of my favorite mechanical systems for roleplaying. Shiver World will merge the two of these: the flavor of Ehdrigohr with the smooth action and fluid play of Dungeon World/PBTA style games..
Shiver World will be available as a digital document in the fall of 2016. If you are interested in helping by writing moves or classes, converting monsters, or playtesting, please get in touch. 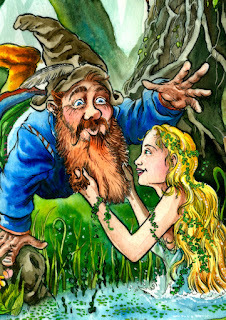 One thing is for certain: there is not enough out there about Tom Bombadil. The silly, mysterious character from The Lord of the Rings, and his own stories, has entranced readers for years with his poetry and vagaries. 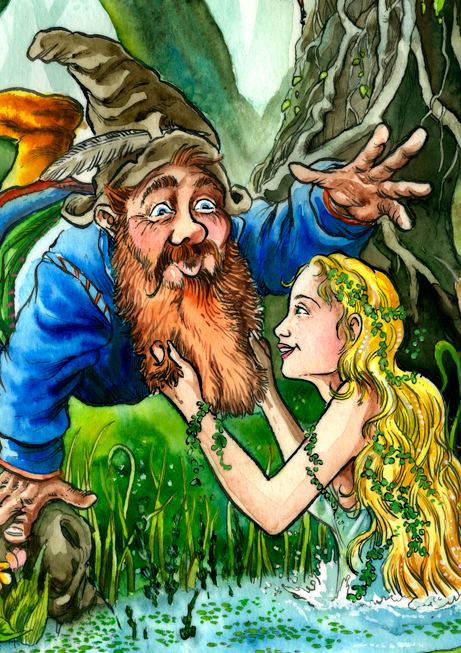 The Adventures of Tom Bombadil is a fast, improvisational poetry game. Players roll using a table and find a positively Bombadil-esque word, then write their couplet. After everyone goes, a stanza is completed and, after a few rounds, a whole new poem about Tom and his misadventures! Featuring the brilliant art of Richard Svensson! I was a newcomer to the wonderful Game Chef contest this year, but I gave it a shot. Out came Atlanta's! Ticonderoga Club, inspired by the Matrix, the roaring '20s, and the local restaurant of the same name. The result was an improv-heavy RPG with killer robots, southern society dilettantes, backstabbing, and cellular devices. It's a bit messy, and not nearly complete, but the seed is there. One day I may revise it, improve it, and release it as a game; until then, please enjoy the work-in-progress here.